Because it is a studio type apartment, you have kitchen, bathroom, and shower room. Also, each room has washing machine and AC. 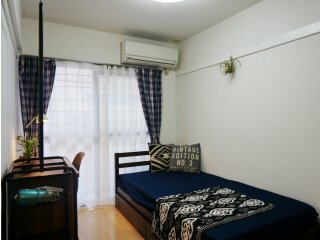 ワンルームマンションタイプのため、個人でお部屋の管理をお願いいたします。 Please clean your room by yourself because it is one room. 全館禁煙。夜間11時～朝7時の間は洗濯機の利用はお控え下さい。 Non smoking. Washing machine and dryer are not available b/w 11PM and 7 AM.